I usually like to take time on Fridays to tell you any behind-the-scenes stuff about Everything Rachael Ray, but, um, there isn't any this week. It was pretty quiet here in the ERR offices (aka "my living room"). Maybe because my husband and I are trying to plan our first trip to Europe? Or maybe it's because some of the craziness surrounding Rachael Ray has eased up a little bit. Have you been watching her talk show? If it was a bit much for you at first, I really recommend watching it again. She's hitting her stride. I read one comment saying that she's just like your Italian Aunt, boisterous and talking with her hands while cooking. That seemed like an apt description to me. 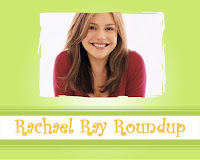 Here's the Rachael Ray news and blog posts I found this week in the Blogosphere. If you write a post about Rachael Ray, make sure you e-mail me so I can include it in the Roundup! Nicky at Deglazing offers several Rachael Ray recipes among her list of suggestions for Super Bowl parties. Stephanie V.W. Lucianovic at Chow's The Grinder discusses food brand placement on TV and notes that the Food Network (and Rachael Ray) don't participate. Susan at Susan's Spa gives her thoughts on Get Real Meals. Bug n' Belle is a new Rachael Ray fan. I have to agree that Leek-y Chicken is a great dish. Yumsugar is running a poll on what your favorite magazine is. When I voted, Every Day with Rachael Ray was running in second behind Cooking Light. Ali at Something So Clever included several Rachael Ray recipes in her weekly meal plan, including Chicken Lo Mein, Chorizo Stuffed Bread Bites/Keilbasa & BBQ Sauce Stuffed Bread Bites and Chicken Parm Meatball Subs. Sounds like a good week to me! Recipe Voice offers a review of Rachael Ray 2, 4, 6, 8: Great Meals for Couples or Crowds. Erin at Erin Cooks is not a fan of the name "Double Chicken Dumpling Stoup," but the recipe was a hit. Celebrity Dog Watcher has an idea for a custom stamp: Rachael and Isaboo. Marisa Sgroi of St. Joseph University's The Hawk newspaper lists Rachael Ray in the Hot category (as opposed to the Not category) because Rachael's recipes mean she's "no longer forced to hit up the Wendy's drive-thru" when she leaves campus late. This week, TeamSugar asks who you would rather have make you dinner - Martha or Rachael. Martha was winning when I voted. Vera at I'm Not Obsessed has some pictures from Mena Suvari's visit to Rachael Ray's talk show, while Hot Celebs Home has pictures of Katharine McPhee performing on the show. Thanks :) I'm glad you appreciate the fact that I have such a torrid relationship with Miss Ray. I love her, I usually devour her meals when I make then (and thoroughly enjoy each bite), but sometimes I do think she goes a bit overboard with the acronyms and cutesy phrases. PS: Did you see that Cinnamon Roll, maple syrup, bacon concoction she made on Thursday? Oh my GOD. My thighs grew just imagining what it would taste like. Erin - you are allowed to dislike both her acronyms and her cutesy phrases as long as you keep trying her recipes and posting about it! No, I haven't seen that one but thanks for warning me!